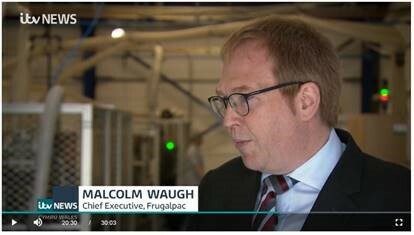 We were delighted that the media joined us to witness Assembly Member, Lesley Griffiths officially open the Frugalpac factory in Wrexham last Friday (15 March). We gave ITV Reporter Rob Shelley and Craig Colville from The Leader a tour of our new 18,000 square foot manufacturing facility at Wrexham Industrial Estate where we produce the first fully recyclable coffee cup made from recycled paper. “I’m pleased to announce the official opening of our Frugalpac factory in Wales, where we are manufacturing the world’s first easily recyclable coffee cup made from recycled paper.